As one of their assignments, my college students are required to create a practice test using pre-selected math vocabulary. This activity prompts them to review, look up definitions and apply the information to create ten good questions. Since I want the questions to be more than Level 1 (Remembering) or Level II (Understanding) of Bloom’s Taxonomy, I give them the following handout to help them visualize the different levels. My students find it to be simple, understandable, uncomplicated and straightforward. 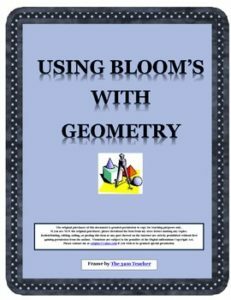 This free resource consists of six activities which follow the revised six levels of Bloom’s. (uses verbs instead of nouns). In this freebie, each learning tier uses plane geometry shapes to clarify and explain the level.